Dogs and cats bring love and companionship into your home, but once the weather turns warm, your pet may also bring in annoying houseguests: fleas. These tiny biting pests reproduce rapidly and can make you and your pets uncomfortable and possibly even sick. Never fear, we’ve rounded up six all-natural ways to fight fleas safely and effectively. Combing your cat or dog daily with a flea comb is the first step in flea control. These fine-tooth combs have double rows to effectively remove and trap fleas and their eggs from your pet’s fur. Rinse the comb in a bowl of sudsy water, using non-toxic pet shampoo to drown the pests. Regular lemon baths for your dog will effectively remove and prevent fleas. 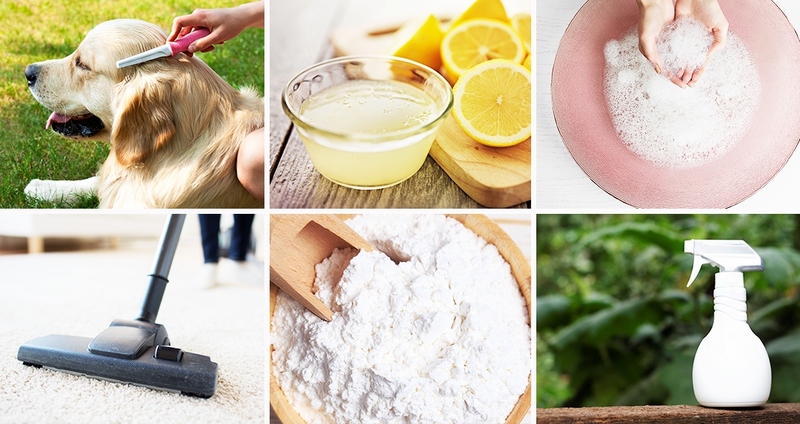 Simply add 1 cup of water and a ½ cup of freshly squeezed lemon juice to every ½ cup of gentle, nontoxic pet shampoo. Re-comb their fur post-bath to capture any castaways. Lemon is toxic to cats, so skip that ingredient if you take on the challenge of bathing your cat. Unfortunately, for every flea you see on your pet, there are dozens or more unseen fleas lurking in the carpets, bedding and crevices of your home. Setting up traps helps eliminate the infestation. At night, fill a shallow bowl or pie dish with soapy water; illuminate it with a nightlight or other light source and place near your pet’s bedding or other infested areas. Fleas are attracted to the warm light and will drown once they jump into the sudsy water. If you don’t like the idea of soapy water next to your pet, you can purchase an electric flea trap, which attracts the fleas to illuminated sticky pads. You can eradicate fleas and their eggs via a thorough vacuuming, and by frequently washing animal bedding and other infested upholstery. After vacuuming, be sure to clean out the vacuum by sealing up the bag and removing it from the house. Steam-cleaning carpets and upholstery with a nontoxic cleaner is another safe option to decontaminate infested areas. Food-grade diatomaceous earth is nontoxic to humans and pets, but the fine, talcum-like powder is lethal to fleas because its microscopic razor-like edges dissect and kill pests of all kinds. Sprinkle a fine layer on carpets and hard floors and even rub into your pet’s coat, but take care to not inhale the dust. Wait 24–48 hours to comb your pet or vacuum floors, and then reapply as needed. Undetected flea larvae can hatch weeks or even months later, causing a reinfestation. Preventing fleas in the first place saves a lot of hassle. To make an all-natural flea-preventing spray for your pet, find a good-size spray bottle and add one quart of water, plus one cup of apple cider vinegar. For dogs, you can add 2–3 drops of lavender or cedar essential oil to the bottle; however, cats won’t tolerate those strong smells. Spray on your pet’s coat, bedding and collar, but be careful to avoid your pet’s face. Instead, soak a cloth in the mixture to rub around your pet’s head and neck, avoiding eyes and ears. For your dog, you can dilute a few drops of the essential oil in 2 tablespoons of water and rub the mixture directly into a bandana and tie loosely around their neck. Reapply the oil mixture to the bandana once a week to keep fleas away.